Last week was a tough week to bear, from the guns of Louisville through Pittsburgh and the man with the bomb plan and his sheets of flag stamps. Evil should not surprise me, it should not baffle me—and yet it does baffle me. Should I also feel sad along with bafflement? A good question for lengthy political analysis, but that won’t change how I feel beholding this. I’m not naïve. I’ve lived a long life, and I’ve met a fair cross-section of Americans in it. Ignorance, racism, clan and gender prejudice—humans are prone to this. If I had a great deal of experience outside of the U.S., I would expect to find these things elsewhere too. But now and here, we have a benighted charlatan—in over his head—who trashes around in these things, knowing in some simple, instinctual, skunk’s way that this cloud of stink will confuse us from considering him. In a few days our imperfect democratic republic will have an election. I do not suppose to know what will happen. I’m a poet and musician, go elsewhere for predictions. Poetry and art allow us to see more vividly across our temporary borders of place and time, but that sort of perspective doesn’t necessarily make us better prognosticators. In poetry and music, like in history, everything is possible, and over the long time, a great deal of the possible will become. So here I sat, in this mere and disturbing week, having trouble considering the attempted and achieved beauty of my arts—because, in this stink and sadness, what can be meaningfully beautiful? 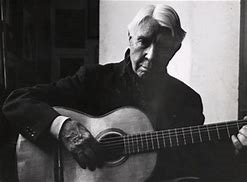 As I did earlier this fall feeling like this, I turned again to reading Carl Sandburg for my soul’s sake, for the early 20th Century Sandburg had seen every evil I have seen, and yet retained an embrace of humanity. Often here I focus in on the neglected Modernist Sandburg, the forgotten Imagist Sandburg of short poems that sing our overlooked, ordinary, humanity. Sometimes I fear the more expansive, Whitmanesque voice that Sandburg also used has drowned out the individuality of his shorter, less shouty poems. But I needed him to shout some of his heart into me this week, so here’s Sandburg’s “I Am the People, the Mob.” The player is below to hear it. I’m glad you liked it! There’s quite a variety of stuff here from the years we’ve been doing this too.